Announcing the winners of the 31st ever Right Place Photo Caption Contest! Presenting the top 25 captions for this picture from Tullio Puglia/Reuters via Yahoo! #25: "All right, boys... remember, heads down! Don't look directly at Meduzillary without the mirrors!" #24: "That was close. I almost stepped in that Chirac." #23: "Rachel Corrie? That you?" #22: "It resembles the Democrats' platform, but we all know what it really is." #21: Donald Rumsfeld was mildly surprised to learn that Howard Dean can poop and fly at the same time. #20: "Now, if you look closely, you can see where we keep the Democrats." #19: "I don't want to see the pigeon that left that!" #18: Aide: "Jack Bauer's Work?" #17: "Gentlemen, THAT is what happens to you if you make Chuck Norris angry." 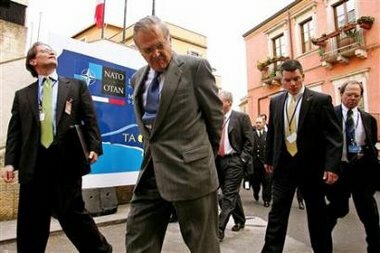 #16: "Perhaps there's something to this 'global-warming' theory afterall," thought Rumsfeld as he walked through the canals of Venice with his detail. #15: "Senator Kerry, get off your knees. We have a better way to deal with these terrorists." #14: The agents felt secure, after all, "Mr. Rumsfeld's" hands were tied, and there were 4 agents covering him. But they were in for a surprise... He was beginning to believe that he was... THE ONE. #13: "Sorry, Helen Thomas, but you really shouldn't pop out of a dark alley like that... Do you require medical attention?" #12: In Howard Dean's most frequent psychotic dream sequence, Sec. of Defense Donald Rumsfeld is cuffed and frog-marched to stand for charges before the members of Democratic Underground. #11: "That, boys, is a warm, steamy pile of malaise --- otherwise known as Jimmy Carter's Legacy." #10: "So that's what happened to the Democrats' credibility!" #9: "Sometimes you have to go for a walk with the shoes you've got, not the shoes you want or wish you could have. And the pair of shoes I'd want before stepping in that... has never been made! That pile right there, that's a known unknown and I'm steering clear of it." #8: "Well, if you had to arrest me for something, it was worth it for decking that Pelosi b*tch!" #7: "Here's another one. We must be getting close to the Vice President's party." #6: "Hmmm... that's interesting. Make note of that, Johnson, for future reference: pedestrians in Tunis don't have the right-of-way." #5: A few seconds later, a scuffle broke out as Rumsfeld and his entourage simultaneously spotted a quarter on the street. #4: "Okay, so now we know a Euro dropped from the top of the Eiffel Tower will kill a man. I owe you a Coke." #3: "The White House press corps ninnies insist on us reporting any significant item to them right away. Inform them there is a pigeon fatality on Albury Drive." #2: "Ok, boys, help Senator Kennedy get to his feet and pour him into his Oldsmobile." #1: "Hmmm... Looks like Cheney's been wandering around with the safety off again." Here are the overall rankings for the first 30 caption contests!!! The Democrat Family Album... a Tribute!